This attempt is inspired by a post I read here for designing ATM machine for children by Lucia Liu. 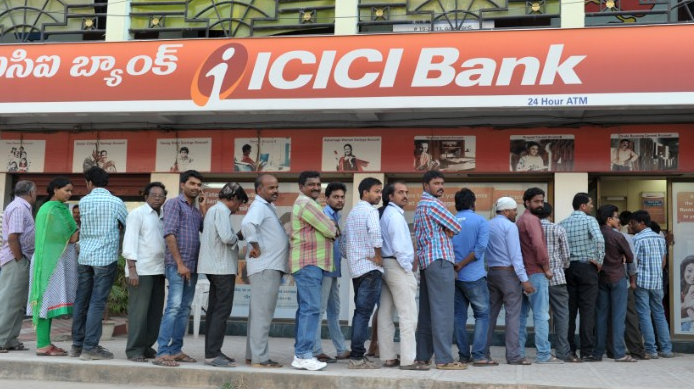 I lived in India most of my life and long queues outside of ATM machine are very common in most cities. This is my armature attempt to design an interface that might help in reduce waiting time in such queues. The goal is to make interface simple enough that almost everyone can understand it. I would prefer a voice guided system as well that will direct people the next steps in sync with screen. Some people are still not well educated in some parts of the world but they bank accounts. Below is my home screen if you call it. Let’s call it step 0. Step 0 : Home screen. From here you can change language or report lost card or activate voice assistance. The speaker icon is for voice assistance. The fingerprint scanner will be much faster and convenient for most people. Step 2: Select cash out. 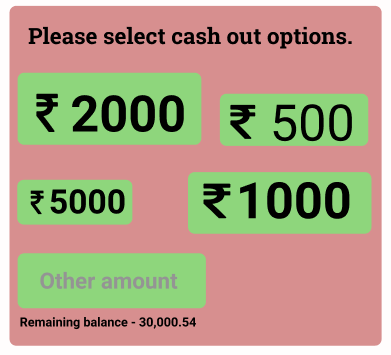 Here, cash out options are shown based on consumer’s history or most common cash out option among population. Size represents order. It will save more time if consumer is looking for the same option. Now in most ATM interfaces I saw there is a ‘check balance’ option. I don’t think we need it here. It’s 2 extra step (1 — check balance, 2 — go back to old screen to proceed). Hence I display remaining balance in same screen. I also omitted one more unwanted step — To select account type: savings or credit. This option is still there in many interfaces. I think machine should be able to detect that from the card itself. Step 3: Collect your cash. Preferably with a bell sound. I guess that’s it. In three faster steps, most people will be able to get the cash. I think taking cash out should not take more than a minute (average time with current system I believe is 4 -8 minutes). If 70% people are using only three steps above, it will save a lot of time for people who are waiting outside in a queue. I also designed other steps which people would take sometime. Step 0.5 : Report lost card. 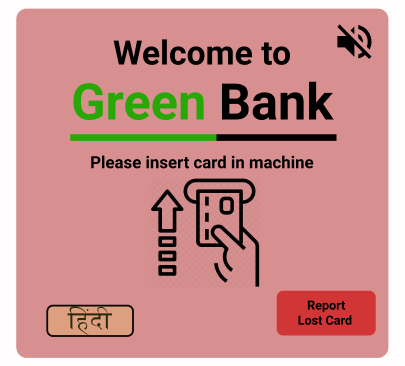 This step should be only for native bank cards (Green bank) but it can be implemented for other bank cards in same system as well. We will just need more info in latter case. Below are two screens for reporting lost card / blocking card for 24 hours. You might find the card at some corner later. If not, call customer care. Cancel button will take you back to home screen. Step 2.5: Enter other amount of your choice. Well, there is no keyboard option here. We don’t want people to enter amounts other than rounded. So we give a list which should be scrolled (couldn’t show a scroll bar). After used touches an amount, the amount space will be populated and pressing that amount will take you to step 3, take cash. 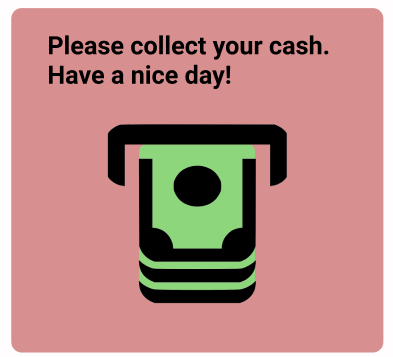 The list of options in this case will not have amount exceeding the daily cash out limit left or the available account balance whichever is lower. There is still much work to be done here. System like this which are used by hundreds of millions of people everyday is not easy to design without doing extensive user research. Still, this was a fun little project for me and I am thankful to people here who are taking time to read posts here and motivating designers to create and try new designs everyday. Cheers. 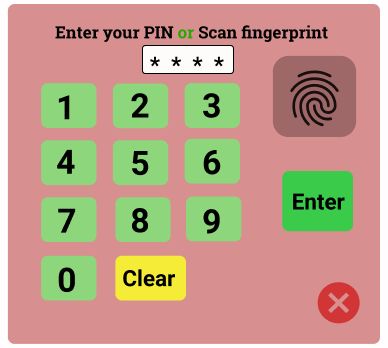 Simplifying ATM UX for large populations was originally published in UX Collective on Medium, where people are continuing the conversation by highlighting and responding to this story.